One of my favorite things to do is to combine colors and pattern. Paper is a fun medium for me. Recently, I knew I wanted a “READ” sign to hang above the kid’s book shelves in the basement. I had bought some paper that I actually thought was contact paper, but turned out to be crafting paper. Since it has peeled off a another project, I decided I would have to find another way to use it. 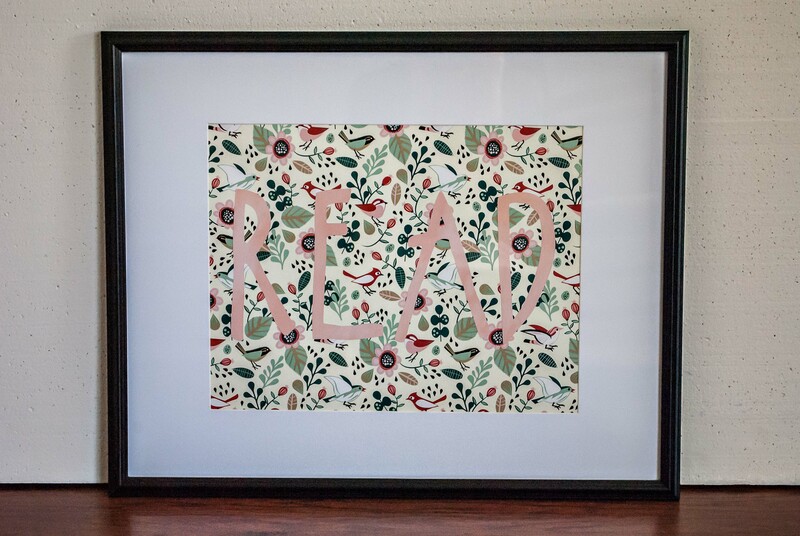 I love the print and colors, so I used it for this “READ” sign. -16X20 frame with 11X14 mat. This project is timely because I recently began exploring why Jane is struggling with reading. We got a letter expressing concern about Jane’s poor reading grade. I was not surprised and already saw all the signs leading up to this. We have books all over our house and Jane loves to be read to, but, although she knows how to read, she is a very slow and distracted reader, and I have seen some alarming signs since she was much younger. She is starting to fight us about reading and even complaining that she does not want to go to school, even though she comes home and tells me cool things she is learning. I believe Jane is dealing with Dyslexia, a language processing problem. I spent a large part of yesterday learning more about Dyslexia at Bright Solutions for Dyslexia. A whole new world has been opened to me. Dyslexia is more common than I thought and it is still so widely misunderstood. I am so thankful for local resources that can help us help Jane. I am looking forward to implementing new learning styles for Jane to help her be successful. It is so important to me that Jane loves reading, learning and school. This experience has humbled me. For some children it is simply a matter of reading to them, having books around and going over the alphabet in the traditional way. For us, our journey will be untraditional; we will use new learning tools. I am grateful that there is research-based practices available. There were so many in the past that tried everything without success and it impacted their self-esteem and lifestyle. It impacts 20% of the population. Those who have a family history of Dyslexia have a much higher chance of having it…50/50 chance! It is one of the most inheritable conditions. They have linked certain chromosomes with Dyslexia and experts hope that someday babies will be able to have their inner cheek swabbed and the saliva tested at birth. Parents can use results for early intervention for children who test positive. There are some people and schools that still believe that Dyslexia does not exist. Many parents still have to fight for classroom accommodations. Dyslexia is far more complex than simply reading something backward; it is a language processing problem, so it impacts reading, writing and spelling. It has a lot to do with auditory processing. There is an actual difference in the brains of those with Dyslexia: the right side of the brain is 10% larger. Most people with Dyslexia have exceptional gifts and talents in other areas. Check out the videos on Susan Barton’s website about Dyslexia at Bright Solutions to learn more. 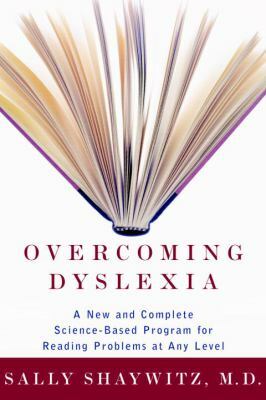 Susan Barton recommends Overcoming Dyslexia by Sally A. Shaywitz. I am excited to share this journey with you. Keep reading and making your home a safe place everyone to learn, fail and try again.